This may look like an easy game at first glace, but you would be sorely mistaken. Last season, Fairmont State went 34-3 and reached the Division II National Championship Game to Northwest Missouri State 71-61. The Fighting Falcons also took out Division II powerhouse Bellarmine in a 79-68 win in the Elite Eight to reach the Final Four. George Washington has a lot of new faces this year, only returning six players from last season, with nine newcomers. If GW isn’t careful, they could very easily have their hands full in this game. Howard is a team that the Colonials have historically seen success against. GW leads the all-time series record 7-1 with the last meeting coming last season when GW won 79-62. This is GW’s only true road game the entire month of November. Last season, the Seminoles smokes the Colonials in the BB&T Classic 67-48, though it was the second game in two days for GW who had clawed out a hard-fought win over USF the game before. Kevin Marfo was the only Colonial in double-figures with 18 points. 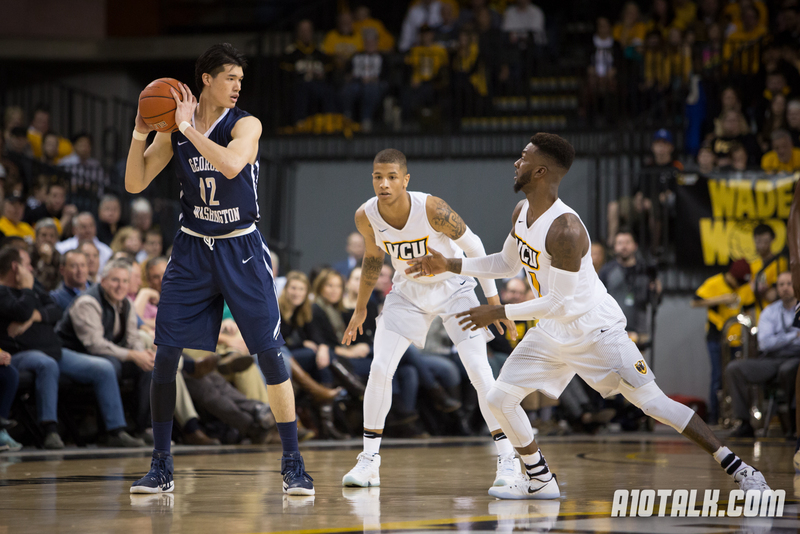 As he is longer on the team, GW is going to need big games from Yuta Watanabe and Jair Bolden if the upset is going to happen. Assuming there is no post-Florida State hangover, this should be a rather winable game for Mojo’s squad here. Hampton struggled last season and has never fared well against the Colonials in recent memory. Similar situation to the Hampton game: as long as GW is not looking ahead to Xavier in Vegas, they should have no problem winning this game either. This is a game I have had circled on my calendar since this game was announced over the summer. Back when the Musketeers were in the Atlantic 10, there were a team that GW always seemed to take right to the wire and a team that GW always was just short of beating. In addition, with the exception of last season, the Colonials have seen unprecedented success against big-name schools in neutral site games, especially around holiday time. The last time GW played on Thanksgiving Day was 2013, when the Colonials downed Miami in OT in the Wooden Legacy. Just sayin’. Should the Colonials face Kansas State, in could be the second time in two days they will have chance to slay the demons of their past. Back in the Mike Lonergan era, GW had a home-home-and-home with Kansas State, with two games being played on the road. In all the games, the Colonials were in it, until the second half at the very least. But GW went on to lose all three games, including a heart-breaking one at the Smith Center in 2012-13 when a Dwayne Smith was just off the mark and GW lost by three. Arizona State, on the other hand, is a team that GW has never faced, which could add another level of intrigue should the two teams meet in Vegas. Morgan State is another team that GW has historically had success against. As long as the team stays focused after their trip to Vegas, this should be an easy win for the Colonials. Dating back to the days when the Owls were in the Atlantic 10, these two teams always seem to play instant-classics every time they meet, and last year was no exception. Tyler Cavanaugh drained a three from the right-wing corner with 7.8 seconds left that would help GW steal one from the Owls in Philly last year. On a side note, (unless schedules change) George Washington will be only Atlantic 10 team playing in Capital One Arena (formerly Verizon Center) this season ahead of the A-10 Tournament being held there in March. This game has the potential to be one of the toughest tests for GW, facing a very underrated Princeton team. Last year, the Tigers went 23-7 and 14-0 in the Ivy League, en route to the NCAA Tournament where they fell just short of an upset over Notre Dame. Plus the young Colonials are going to have to remain patient defending the Tigers’ potent Princeton offense. The only other true road game for GW in non-conference this season comes in Happy Valley. Penn State has won two of the last three meetings between the two teams including last year and in 2014-15 (the last meeting at Penn State). This should be another tough game for GW, especially since historically, the Colonials have struggled on the road at times. Besides the fact that a big-time ACC school is returning a game at the Smith Center for only the second time in recent memory, this game really intrigues me. Last season, the Colonials got down by 22 point very quickly before clawing back to tie the game at 40-40 late in the first half. And though Miami pulled it out late to win 72-64, the Hurricanes seemed to struggle to defend Yuta Watanabe in his first game back returning from injury, as he scored 15 points. Should Yuta be back at full-speed in this years game, I could see GW giving Miami a game. This game is definitely not one to sleep on or to have a post-Miami letdown in. Last year, the Wildcats had a 20 win season and beat Temple in Philadelphia. And thanks to two early season matchups against Florida and Texas, this could be a battle tested UNH team by the time they arrive in Foggy Bottom. Another team that GW has played very evenly over the years in Harvard. Last year, the Colonials squeaked out a 77-74 win over the Crimson in Cambridge, though Harvard went on to an 18-10 record finishing top four in the Ivy League. This is without question one of the toughest schedules I can remember GW having in a long time. There is certainly the potential for a lot of RPI-building wins and victories over Power 5 schools. That said, this team is very young and may have its share of growing pains. However, if I’ve learned anything from following this program for the past 19 seasons, it’s to expect the unexpected. : it is college basketball, after all. GW fans: Follow @A10TalkGW for Basketball updates.